Is it Safe to Say Hello? Recently I was at the Toronto Beaches and I witnessed an incident that caused me to have a full-on, eye-opening Oprah moment. There was this lovely family standing in front of us in line for the ferry. They had brought their small, mixed-breed dog along for a day at the beach and were heading home after what I’m sure was an exhausting day. As I sat absentmindedly observing the dog I noticed the little boy (who was also tired), start to poke the dog’s eyes. He was also doing this extra charming maneuver that I can only describe as a “neck skin squeeze”. What do the parents do? You guessed it…nothing. What does the dog therefore have to do? Growl and snap. In response, the little boy screams, “BAD BOY” and smacks him on the top of the head. As shocking as this was, it wasn’t what prompted this blog. About five minutes after this exchange a small girl comes up from behind me and asks if she can “pet the doggy”. My jaw drops to the floor as the owners casually quip, “SURE! he loves kids”. It literally takes every ounce of self-control not to whisk that little girl to safety. Instead her parents watch as she bends down to engage a dog that had just snapped at a child a few moments earlier and who was so over-threshold that he could explode at any moment. He stiffly allowed the little girl to touch him while he licked his lips, yawned, and moved away. Can you guess what my lightbulb moment was? Just because a dog owner gives your child permission to pet their dog does NOT mean it is safe to allow it. Sometimes just teaching your child to ask for permission isn’t enough. In fact, the average dog owner has no idea whether or not their dog actually wants to be petted. They’re basing their answer on the fact that the dog has never (up until now) bitten a child. They’re not basing their answer on whether or not their dog is enjoying the exchange or whether the dog’s body language is showing stress, fear, or discomfort. This means, parents, that the responsibility is yours. Become an expert at reading a dog’s body language. Teach your children how to properly invite a dog to say hello by slightly crouching, turning sideways, and keeping hands in. 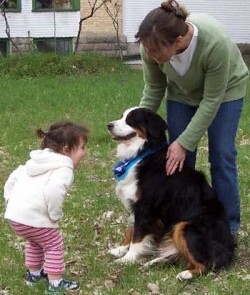 If a dog moves away, or even leans away from your child, he does not want to say hello. I know how painful this can be for kids to accept; believe me, I was one of those kids that would lovingly squeeze the head off any dog in a two mile radius. However, it’s well worth risking your child’s disappointment if it saves them from becoming yet another news headline.